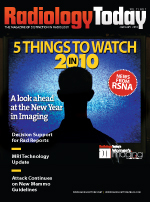 RSNA 2009 offered its usual vast array of scientific and clinical education for radiologists. Amid the papers, courses, and technology on display in the exhibit halls, the annual meeting offered hints of where medical imaging is headed. This article is one person’s view of four things to watch from RSNA that will affect imaging in the coming year and beyond. We here at Radiology Today would like to share your views on what to look for in 2010. Send your thoughts to jknaub@gvpub.com. And here’s hoping that you and your organization meet the challenges you face in the coming year. How do you measure and prove that you provide good care? That question may be central to radiologists’ future success, according to RSNA President Gary J. Becker, MD. In his address at RSNA 2009’s opening ceremony, he told the audience that providing quantifiable quality and value may be the way to avoid the further commoditization of radiology that worries so many people in the field. Diagnostic imaging spending has increased dramatically in the past decade. Growing imaging costs have drawn the scrutiny of budget cutters in both the government and the insurance industry. The hard truth is that when government and insurance executives go looking for cost savings, their gaze turns to big numbers. Diagnostic imaging spending is a big number. • What you can’t measure, you do not know. • What you don’t know, you can’t improve. • Without observation and measurement, there is no improvement. Becker sees quality improvement as a way to reduce waste in healthcare, save money, and help physicians retain some of their ability to self-regulate their industry. The United States spends an estimated $2.5 trillion per year on healthcare, of which approximately 30% to 50%—according to Institute of Medicine and RAND Corporation research, respectively—is unnecessary wasteful spending. And there’s probably nothing exempts radiology from these broader numbers. Measurement-based quality improvement has been used to make numerous industries more efficient and less expensive. Wal-Mart is famous for its ability to use IT and quality improvement for squeezing savings out of its operations, some of which it passes on to consumers in the form of lower prices. Applying that discipline to healthcare could produce real savings. Eliminating one quarter of the estimated 30% waste could save more than $187 billion per year. The downside of those economics is that organizations unable to compete in this cost- and price-cutting environment are driven out of the business. While it’s unclear how healthcare reform will unfold, measurable quality improvement could produce significant savings and strengthen radiology’s competitive position in the changing healthcare environment. Quality improvement efforts offer clinical benefits to patients, as well as improve the bottom line. As Becker pointed out in his speech, approximately one half of the care provided in this country is not supported by evidence-based guidelines. Efficiently delivering the right exam to the right patient at the right time—supported by data—can only help radiology. Expect to watch healthcare reform in 2010 and beyond. Whatever legislation may pass in the coming months will only mark the beginning of reform efforts. While concerns of ever-growing healthcare costs consuming the federal budget (and individual bank accounts) spurred the need for reform in most people’s view, the federal legislation seems to focus on insurance access much more than addressing cost—leaving the finances to be worked out at a later date. That ensures that cost will draw ongoing attention. Provider reimbursement reform is one potentially dramatic aspect of cost control. Janet M. Corrigan, PhD, MBA, spoke on quality measurement and provider reimbursement reform at RSNA. Corrigan is president and CEO of the National Quality Forum, a not-for-profit organization created to develop and implement a national strategy for healthcare quality measuring and reporting. Corrigan mentioned a possible strategy to move away from our traditional fee-for-service medical system and develop one that rewards physicians on outcomes instead of procedures. She said such a change would take 10 years to implement. She envisions that it would start with a bundled payment for an entire episode of care that would pay both facilities and physicians. That may evolve into a bundled payment for, say, one year of care for a patient with a chronic condition such as diabetes. Finally, data developed from those two efforts would lead to a reimbursement system based on outcomes. Critics of fee-for-service reimbursement contend that reducing reimbursement in such a system doesn’t contain cost because it invariably produces a compensatory increase in procedure volume among providers. The best solution, the argument goes, is to separate volume of service from reimbursement. Change is coming to healthcare; we just don’t know what it will look like yet. Children usually learn to share in kindergarten. It often takes longer in DICOM. A new wrinkle in image and report sharing seemed to emerge at RSNA. Several companies, including eMix and lifeIMAGE, unveiled their image-sharing services as a way to distribute images and reports using what seemed to be the new in-vogue marketing phrase: cloud computing. The idea of a Web-based hosted service that will securely store and provide access to images and reports stored on the service’s servers presents an alternative to actual interoperability between systems. An imaging facility can upload its images and reports to the server in the clouds and securely provide access to doctors and patients who have appropriate need for the information. Once a facility downloads the image and report, it has the option to import the data to its PACS as receiving a CD. For example, eMix is beta testing its system at three Kalispell Regional Medical Center facilities in Montana; each site has a different PACS. The approach could also be used between organizations. One issue to be fully worked out is payment; eMix plans to charge based on downloading information. Adding such a new layer might work, but the Integrating the Healthcare Enterprise (IHE) effort to foster systems that communicate directly is still under way. At RSNA, IHE demonstrated its Cross-Enterprise Document Sharing profile—also known as XDS-1—which is designed to share medical information across organizations and with patients. Ideally, systems would be able to communicate directly, but HIT professionals have legitimate concerns about allowing outsiders access to their systems, and some manufacturers have shown little interest in seeing their systems easily communicate with others. More efficient image distribution would reduce unnecessary retests and improve clinicians’ access to the information they need to better treat their patients. Reducing retests also saves time and money. It will be interesting to see how efforts to better share information pan out. Teleradiology enables the potential for greater competition in radiology. Some groups employ the technology to expand their practices or ward off competitors. Some hospitals use teleradiology’s availability to make their current contracted groups more responsive. Current and future ways to use remote reading will likely foster increased competitiveness. In years past, competing outside of a radius of a modest drive did not make sense for most groups. The evolution of teleradiology toward more subspecialty and final reads and the economic pressures on healthcare are spurring groups and hospitals to explore different arrangements for practice building.